• How to GeoTarget brand search advertising to drive retail traffic and sales by utilizing the four main search advertising platforms to build maximum brand search presence in yours or your resellers trade areas. • A side by side comparison of the four main search advertising platforms Google Adwords, Yahoo Search Marketing, Microsoft adCenter and Ask Sponsored Listings along with their geotargeting options and features. • The opportunities and limitations of each search advertising platform’s geotargeting product. Overall, my presentation will show brand managers how to maximize the effectiveness of their brand advertising budget while increasing brand lift. Brand marketers who establish a search brand presence through the creation of comprehensive geotargeted search advertising campaigns will expand their competitive reach and advantage over their competitors who don’t. I will post a more detailed presentation outline here in the near future. In a previous post I wrote about the differences I found between the four major search engines Google, Yahoo, MSN and Ask and their search advertising geo-targeting options. I stated Microsoft didn’t offer geotargeted search advertising options to its advertisers. However, Dave Naffziger pointed out Microsoft AdCenter’s geotargeting features can be found under the “edit ad group settings” instead of the “edit campaigns settings” like in Google, Yahoo and Ask. 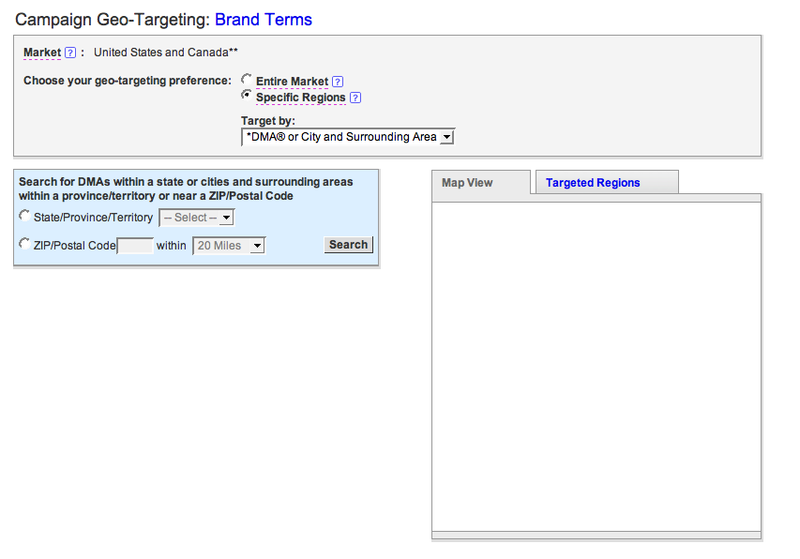 Like with other search advertising platforms, Microsoft ads can be targeted by country or region and then targeted specifically to cities within a region. 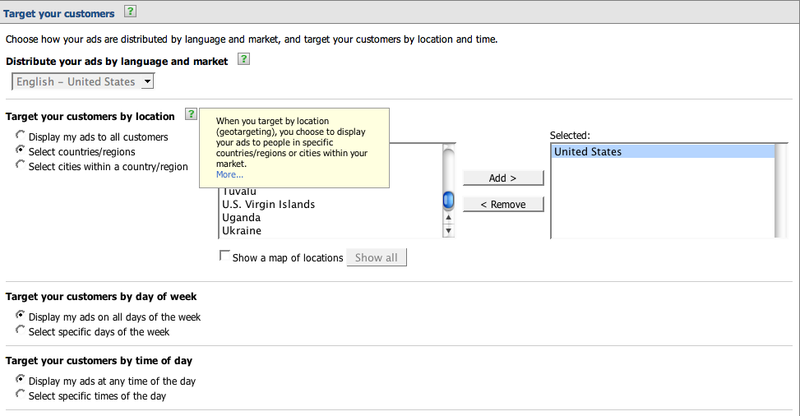 Although Microsoft lists all countries worldwide available for targeting, only five countries can be selected for geo-targeting search advertising through Microsoft’s adCenter at this time. The United States, Canada, United Kingdom, France and Singapore. 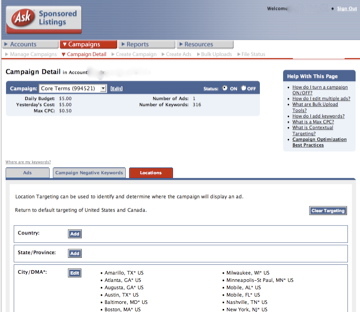 Once a country or region has been selected, advertisers can select a limited number of cities within each state to distribute their ads to. Advertisers can’t target their ads specifically for distribution at the state level like they can in Google, Yahoo and Ask. Once a city or cities have been selected for geotargeted search advertising, adCenter then provides a map of the targeted area. 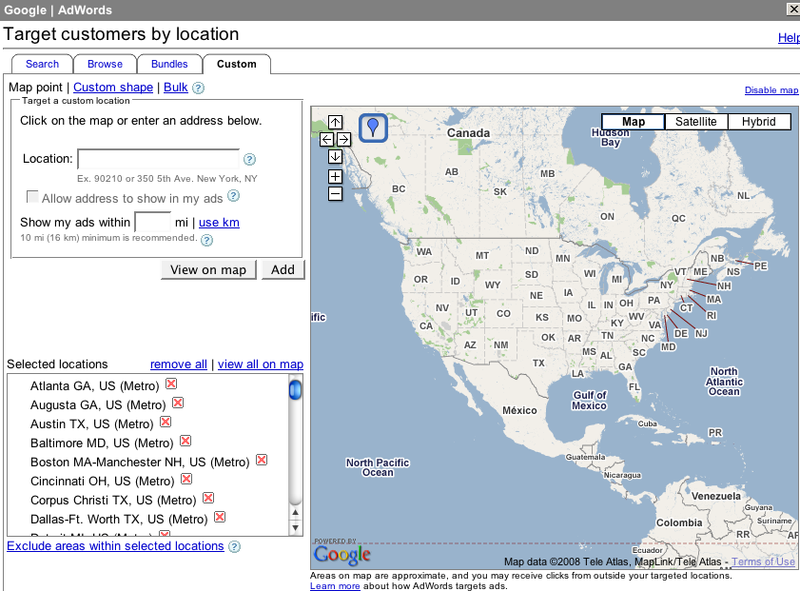 I haven’t yet been able to get the adCenter map to display any of the locations of my geotargeted ads. 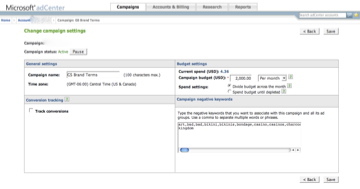 adCenter search advertising features still require further development before they will match the features and functionality already available from the other three major search advertising providers. If targeting local and mobile search advertising is the future growth drivers for search advertising providers, then Google and its Adwords geo-targeting features are in the driver’s seat when compared to its three closest search advertising rivals Yahoo, Microsoft and Ask.com. Below I outline each providers’ offerings not according to their search advertising market share but instead according to their level of geotargeted advertising product development. 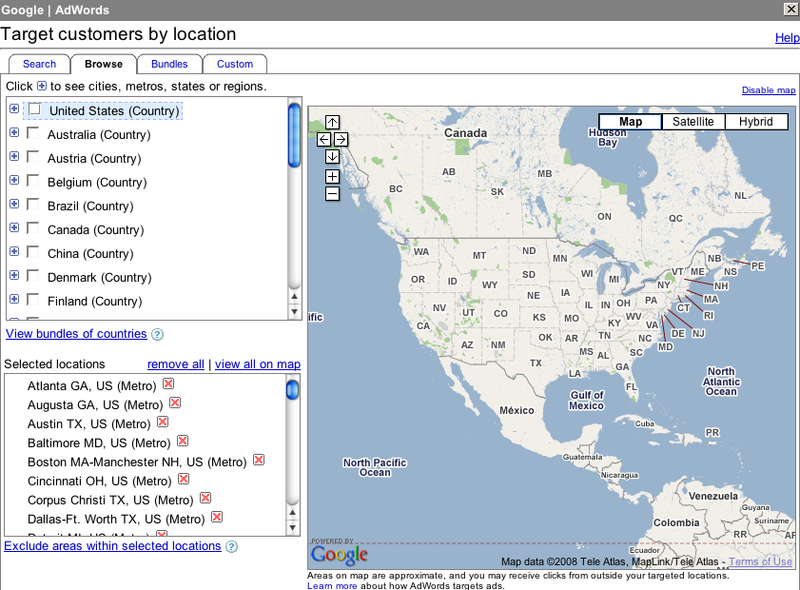 An actual map for geo-targeting the location of your ads and where they will be shown! With Google Adwords, advertisers can target their ads one country at a time through Google’s Country Geotargeting tab, or choose to bundle their ads for display in multiple countries at once with Adwords Bundle Geotargeting feature. Google Adwords advertisers who advertise in specific markets nationally or regionally can target their ads by metropolitan area or by city. Although not referenced, Google’s metropolitan area targeting looks slightly similar to the Designated Market Area system developed by Nielsen Media Research which incorporates Nielsen’s broadcast media markets and distribution scheme. For its City geotargeting option, Google surrounds the target city with a square. Google custom geotargeting by far provides the highest level of geotargeting available from any search advertising provider. 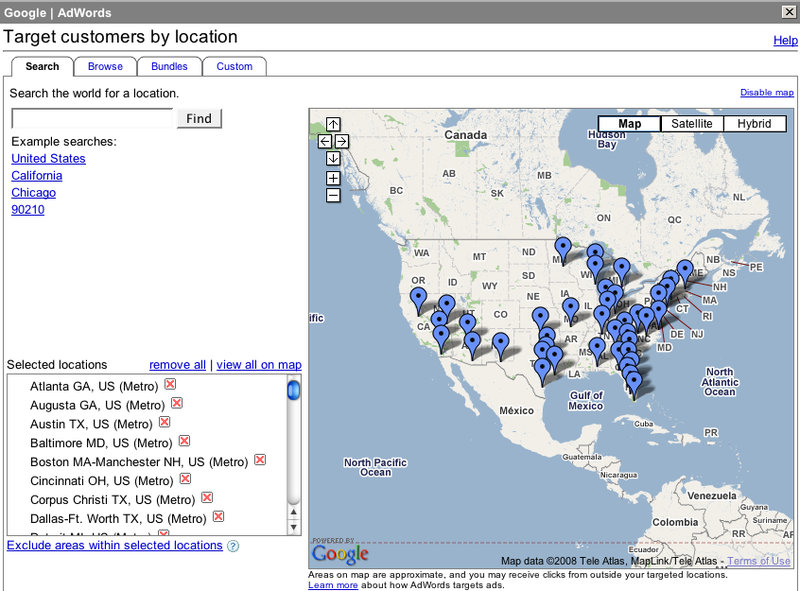 Custom geotargeting lets advertisers create their own custom advertising distribution area within any market. Google search advertisers can simply point and click three or more points on their advertising map and Google does the rest for them – creating a custom advertising distribution area through latitude and longitude coordinates. How do the other search advertising providers’ geo-targeting features stack up compared with Google’s? 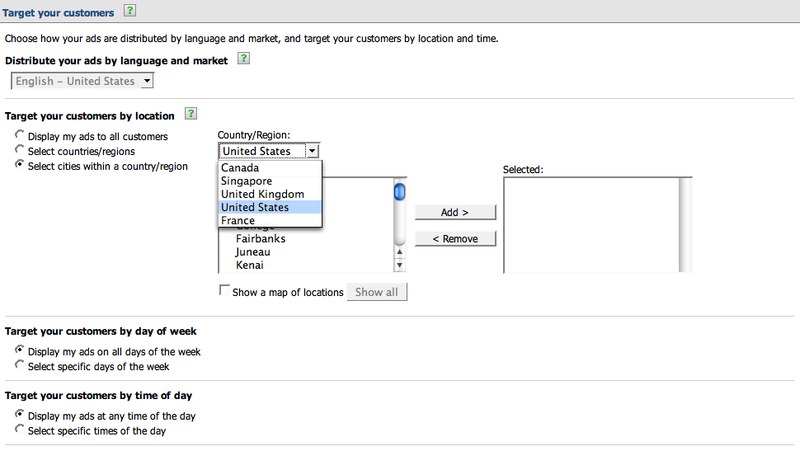 Yahoo and Ask both offer advertising geo-targeting options but both to a lesser degree. 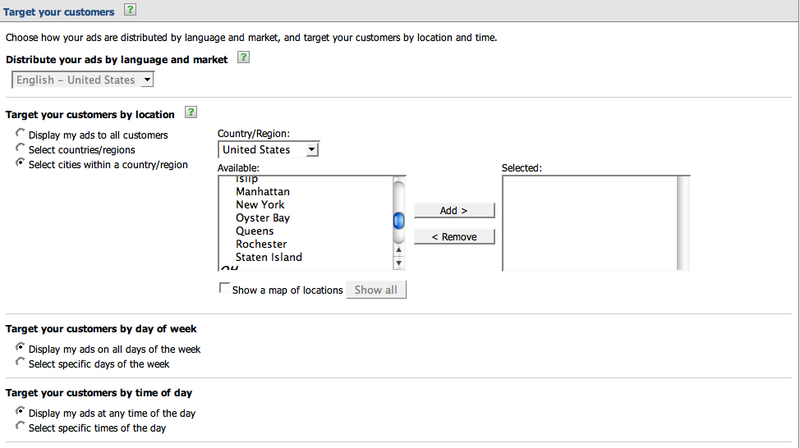 Yahoo offers geotargeting to it advertisers by account market area and specific regions. Account market area is established by the advertising account holder when the open their account. Both account market area and specific region areas are organized by country, state, province or territory. 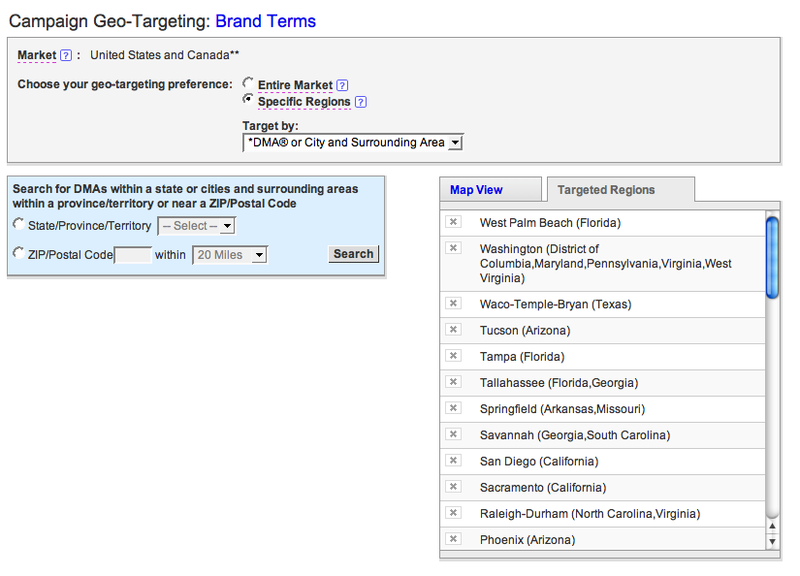 The Yahoo specific region feature geotargets its advertising through the Designated Market Areas system licensed from Nielsen Media Research. Where is the Yahoo Search Advertising Geotargeting Map? Yahoo offers a Map View tab of specific regions geotargeted by its advertisers yet I haven’t ever been able to view an actual Yahoo map showing where my advertising has been geo-targeted and placed. I can’t imagine why Yahoo search marketing would place a “Map View” tab in their Campaign settings geo-targeting page yet not actually provide a map view. Ask provides its advertisers with Location targeting which is also based on Nielsen’s Designated Market Area system. 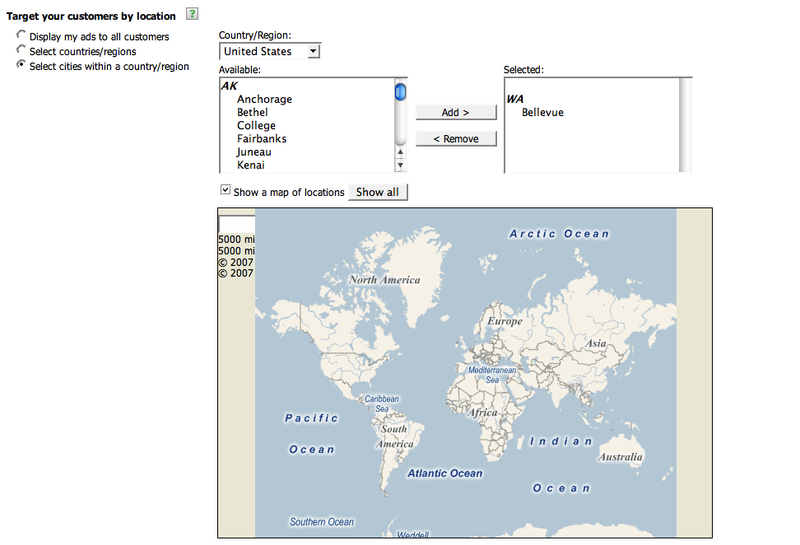 Ask doesn’t provide a map showing advertisers locations of their geo-targeted advertising. However, and to its credit – Ask does provide a geotargeting feature direct marketers like myself would like to see from other search advertising providers like Google Adwords – Postal Code targeting. Postal Code Targeting or Zip Code targeting here in the US would allow direct marketers and brands alike another level of advertising targeting, delivery and thus control. At this point you may be wondering why I chose to cover Microsoft’s adCenter search advertising geotargeting product last even though it has a larger share of the search market than Ask. Why have I listed Microsoft’s advertising geotargeting product development last? Because Microsoft’s search advertising product does not offer its advertisers geotargeting options let alone any other kind of geographic ad targeting. 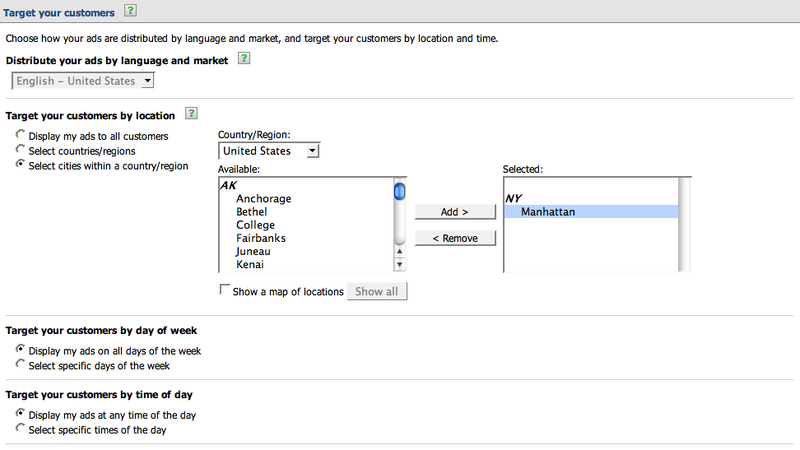 Will Microsoft ever offer advertising geo-targeting features to its advertisers?